Tyronne White and Christie-Leigh Hearder emerged as double champions at the Fuel & Gas Kamberg Classic MTB & Trail Run on Sunday. 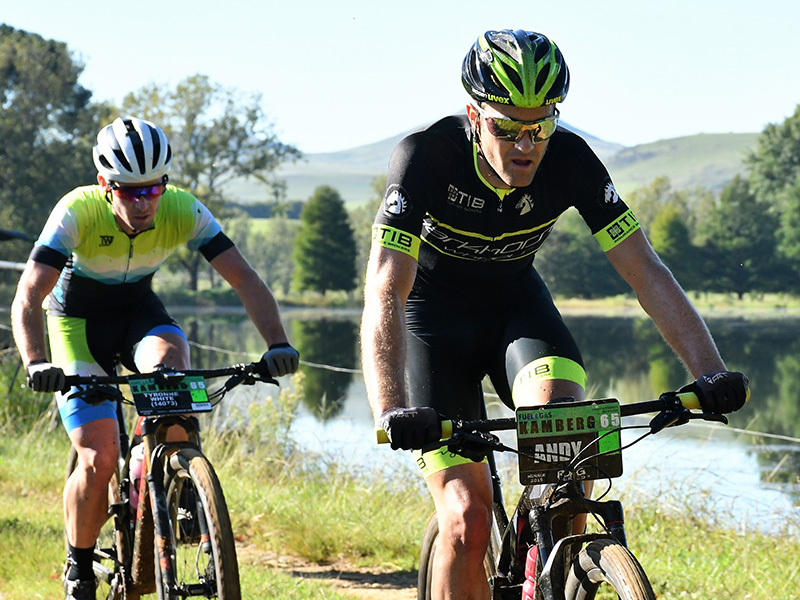 White (Team Ballito Bicycle Co), winner of last month’s Wartburg Classic, edged out Andrew Hill (Darkhorse Wheels) in Sunday’s 65km MTB race to consolidate his early lead in the Quattro ROAG Series. Meanwhile last year’s joint women’s ROAG Series champion and also a winner in Wartburg, Christie-Leigh Hearder, also made it two wins from two races when she was far too strong for the opposition in the foothills of the Drakensberg mountains. Andrew Hill leads eventual winner of the MTB race Tyronne White on Sunday during the Fuel & Gas Kamberg Classic MTB & Trail Run. White has now enjoyed a perfect start toward claiming the R25 000 first prize for the Quattro ROAG Series and his two wins from two races makes him the early favourite to collect the biggest cheque for a MTB Series in South Africa, but the Ballito resident is well aware a lot can happen over a full year of racing. “Andrew and I had a good ride together,” said White after the finish yesterday afternoon. “We had a good sprint for the finish. I think Andrew’s legs are probably still tired from the Epic but he was still very strong today. “David Low went out hard on the first climb and I went around him at the King of the Mountain and Andrew came with me. From there we kept the pace hard throughout and pushed each other all the way to the finish, so it was a good hard race. “The route was tough … it is a proper mountain biking route with three very big climbs and the single track was quite technical. “I much prefer the single track to be a bit more technical but the race organisers have to make sure everybody can ride it, and I think they got it right this weekend. 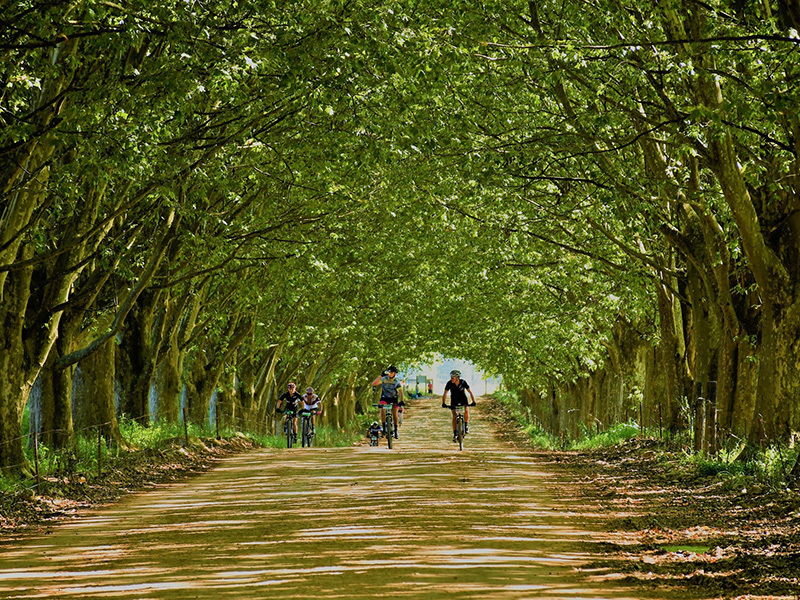 “My wife rode and she is a new mountain biker but she loved it so I think the Kamberg organisers probably got the balance right for the top guys and the less experienced riders. In the women’s race Hearder was in a class of her own and beat Hayley Smith by almost 12 minutes with Nadine Nunes third. 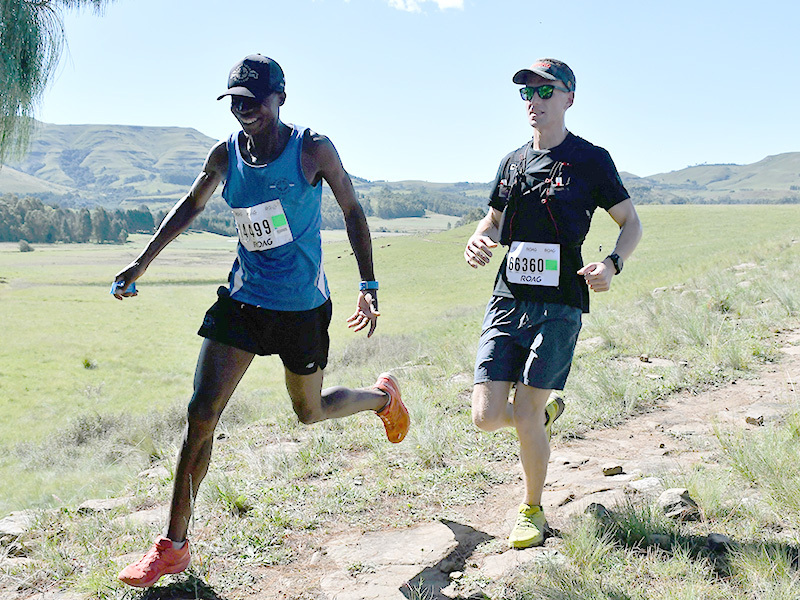 Eventual winner Nomore Mandivengerei leads Nicholas Fowler during Satrday’s trail run. 2018 Quattro ROAG Series trail running champion Nomore Mandivengerei made his first appearance of the year and kept his perfect record intact. After winning six events in 2018 he cruised home to a three-minute win in the 14km race on Saturday. Mdu Zondi claimed second, three minutes behind the runaway winners while Mzwakhe Khanyile rounded out the podium with Nicholas Fowler fading out of the top three. The women’s category for the trail run section of the Quattro ROAG Series is already shaping up into an interesting affair with Sarah Gray taking the win on Saturday, but Apiwe Gaga will take over the series lead after her second runner-up finish with Wendy Mills moving up to second after matching her third position from the Wartburg Classic.